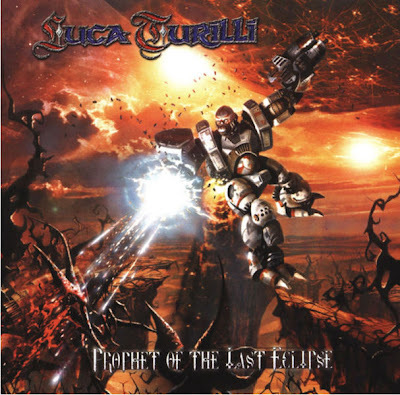 Luca Turilli (born 5 March 1972) is an Italian musician (primarily a guitarist) and composer. He is one of the founders of the symphonic power metal band Rhapsody. He also worked on a trilogy of solo albums as Luca Turilli. He has now formed a second side band, named Luca Turilli’s Dreamquest, alongside Dominique Leurquin, which released its first album, Lost Horizons, in the summer of 2006. More recently in fall 2008 he also began an online guitar course, titled Luca Turilli’s Neoclassical Revelation. The course takes its name from his neoclassical playing style. On every Rhapsody of Fire albums, Luca is the only lyricist and composes all the music with the keyboardist, Alex Staropoli (except for Il Canto del Vento written, lyrics and music, by the vocalist, Fabio Lione) and plays most of the lead guitars. He composes all the music for both his solo projects. He plays guitars on his solo trilogy and keyboards with Luca Turilli’s Dreamquest featuring Dominique Leurquin as the guitarist.